The transition of AKI to CKD has major clinical significance. 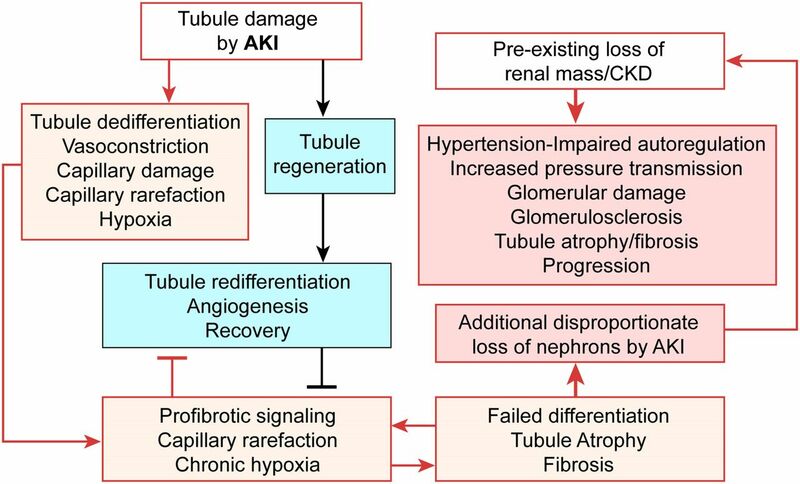 As reviewed here, recent studies show that a subpopulation of dedifferentiated, proliferating tubules recovering from AKI undergo pathologic growth arrest, fail to redifferentiate, and become atrophic. These abnormal tubules exhibit persistent, unregulated, and progressively increasing profibrotic signaling along multiple pathways. Paracrine products derived therefrom perturb normal interactions between peritubular capillary endothelium and pericyte-like fibroblasts, leading to myofibroblast transformation, proliferation, and fibrosis as well as capillary disintegration and rarefaction. Although signals from injured endothelium and inflammatory/immune cells also contribute, tubule injury alone is sufficient to produce the interstitial pathology required for fibrosis. Localized hypoxia produced by microvascular pathology may also prevent tubule recovery. However, fibrosis is not intrinsically progressive, and microvascular pathology develops strictly around damaged tubules; thus, additional deterioration of kidney structure after the transition of AKI to CKD requires new acute injury or other mechanisms of progression. Indeed, experiments using an acute-on-chronic injury model suggest that additional loss of parenchyma caused by failed repair of AKI in kidneys with prior renal mass reduction triggers hemodynamically mediated processes that damage glomeruli to cause progression. Continued investigation of these pathologic mechanisms should reveal options for preventing renal disease progression after AKI. Incomplete recovery from AKI can lead to long-term functional deficits that are severe and progressive in subpopulations of patients with preexisting CKD.1–6 Kidneys from patients recovering from AKI exhibit chronic dysfunction, tubule atrophy, and interstitial fibrosis (Figure 1, E and F).7–20 Incomplete recovery from AKI in patients with CKD not only adds to preexisting pathology and dysfunction but also, may synergize with hemodynamic mechanisms of progression. Severe loss of kidney mass by CKD has long-term adverse consequences attributable to impaired blood flow autoregulation, glomerular hypertension, glomerulosclerosis, and tubulointerstitial fibrosis.21–25 Additional nephron loss by AKI in patients with CKD could tip the balance of functional reserve through hemodynamic effects.4 Thus, failed recovery from AKI may have far-reaching significance. Recent research has provided insights into the pathologic basis for this failed recovery from AKI (i.e., tubule atrophy and renal fibrosis [tubulointerstitial fibrosis]). Injured kidney tissue heals by fibrosis that does not extend to involve previously nondiseased parenchyma. (A and C) Periodic acid–Schiff staining of the kidney from an autopsy of a patient with human FSGS. (A) Advanced scar containing sclerotic glomerulus, atrophic tubules with greatly thickened basement membranes, and interstitial fibrosis is sharply demarcated from completely normal parenchyma (block arrows with red outlines). There is no indication of fibrosis spreading from the scar into the adjacent interstitium. (C) Small scar from the same kidney showing a few atrophic tubules with thick basement membranes and expanded interstitium adjacent to the atrophic tubules (red arrows) near a glomerulus with mild mesangial expansion. The histopathology is one of resolved injury to tubules with development of a shrunken scar in relationship to an atrophic nephron with no suggestion that the lesion is invasive or expansive in its nature. (B and D) Kidney of rat 14 days after AKI was induced by proximal tubule selective toxin maleic acid stained with Masson’s Trichrome. (B) Low-power micrograph showing a localized lesion containing undifferentiated atrophic tubules surrounded by a florid early fibrotic response (yellow brackets). The lesion is sharply demarcated from the adjacent well differentiated proximal tubules that had either recovered normally after AKI or had not been injured by the poison. (D) High-power micrograph showing a single profile of an atrophic tubule with surrounding fibroblastic response (yellow brackets). Adjacent proximal tubules are well differentiated. The interstitium between them is either normal or minimally expanded. Interstitial fibroblastic responses that occur after AKI resolve and regress as tubules recover and redifferentiate or persist and undergo scarring if tubules fail to redifferentiate and become atrophic. (E and F) Kidney biopsy from a patient 10 months after post-transplant AKI with delayed graft function stained with Masson’s Trichrome (provided by Robert B. Colvin, Massachusetts General Hospital and Harvard Medical School, Boston, MA). (E) Low-power micrograph showing shrunken mature scars separated by healthy parenchyma with minimal or no increase of interstitial connective tissue. (F) High-power micrograph with sharply demarcated boundary between scar and healthy tubules. One healthy well differentiated proximal tubule remains within the scar, suggesting that it had not been injured during the AKI episode 10 months earlier or had recovered normal structure during regeneration and repair after injury. Scale bars, 100 µm in A–D; 300 µm in E; 200 µm in F.
Why some tubules damaged by AKI become atrophic and then give rise to subsequent long-term adverse effects, whereas others recover completely is a fundamentally important unanswered question. Particularly noteworthy in the AKI-CKD transition and subsequent progression are epithelial pathologies that prevent tubule recovery, the cellular biology of fibrosis, and the significance of renal mass reduction (RMR) by prior CKD. Here, we review the pathology and pathophysiology of the AKI-CKD transition and its potential over the long term to degrade nephrons that had not been severely injured by the initial AKI insult. Although fibrosis in response to injury is often perceived to be a pathologic and destructive event, it is essentially a self-limiting repair process that restricts injury. After tissue damage, fibroblasts use signaling and genetic/epigenetic programs to proliferate and make connective tissue but then, regress as scar tissue matures and contracts. Therefore, such fibrosis is not autonomous and does not expand or invade normal tissue. Rather, it shrinks. Damage to tubules is associated with fibrosis around them. Endothelial injury and capillary loss around damaged tubules may produce hypoxia that likely prevents recovery of the affected segments and ensures tubule atrophy.30–38 However, such interactions are confined to diseased tubulointerstitial microenvironments. Therefore, as in any other scar, fibrotic tissue that is formed around damaged tubules shrinks over time as activated fibroblasts regress and collagens mature. That is, fibrosis develops only around atrophic tubules, and the surrounding tubulointerstitium remains normal. Pathologic observations bear this out—kidney surfaces in benign nephrosclerosis display shrunken scars alternating with areas of hypertrophic cortex. Biopsies of patients with chronic glomerular disease show clusters of atrophic tubules surrounded by fibrosis that is confined to regions containing diseased glomeruli28 (Figure 1, A and C). Similarly, during repair of experimental AKI, tubules that fail to recover normal structure become atrophic, and fibrosis develops around them in microenvironments sharply demarcated from tubules that had recovered normally or had not been injured (Figure 1, B and D) (AKI induced by maleate and tissue from the work by Lan et al.39). Much later, such lesions would shrink further and become less perceptible (i.e., they do not progress). Fibrotic scars that develop after ischemia-reperfusion injury (IRI) show similarly sharp demarcations from normal kidney tissue (figure 2 in the work by Goldfarb et al.,40 figure 4g in the work by Yang et al.,41 and figures 10 and 11 in the work by Lan et al.39). Indeed, small islands of pristine kidney remain within areas of extensive scarring after IRI (figures 10 and 11 in the work by Lan et al.39); fibrosis had not involved these preserved tubules because they either had not been injured or had recovered normally after injury. Pathologic features of healed human post-transplant AKI with delayed graft function bear this out: 10 months after AKI, there is patchy fibrosis containing atrophic tubules, but the fibrotic scars are clearly separated by sharply demarcated healthy parenchyma, with only minimal focal increase of interstitial connective tissue (Figure 1, E and F). 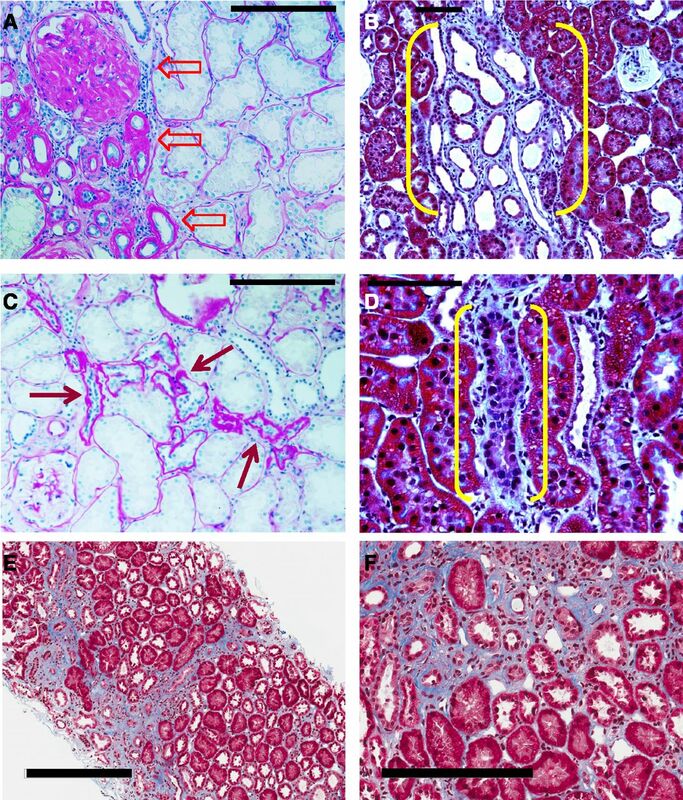 Thus, insights from studies of kidney pathology inform us that progressive renal fibrosis requires additional, repetitive, and/or severe damage of previously normal nephrons unless primary interstitial disease is itself the instigating factor for fibrosis. One possibility is that one or more episodes of acute injury subsequent to initial AKI cause progression. Repeated but not single episodes of myohemoglobinuric AKI caused fibrotic CKD.42 Alternatively, single episodes of massive AKI could produce severe tubulointerstitial fibrosis and consequent RMR, triggering adverse hemodynamic events that foster progression, particularly in settings where functional renal mass had been reduced by prior CKD (see below). These principles apply to all forms of primary glomerular and tubulointerstitial disease: progression requires serial recruitment of nephrons to the injury process—be it slow and indolent or rapid and severe. Fibrosis progresses incrementally, closely following each nephron or clusters of nephrons damaged by nascent injury. Pathologic events in tubules and interstitium interact to produce tubulointerstitial fibrosis. (A) Schematic diagram of (left panel) normal tubule-interstitium and (right panel) early tubulointerstitial fibrosis. Resident fibroblasts in the interstitium may or may not have intimate relationships to peritubular capillaries and basement membranes of tubules. The former type has also been termed pericyte. After injury, this type of fibroblast/pericyte detaches from capillaries, initiating pathologic events that cause capillary disintegration and rarefaction as well as myofibroblasts transformation and proliferation. This process is aided and abetted by inflammatory cells, chiefly monocytes, and resident immune cells, including dendritic cells. (B) Schematic diagram illustrating vicious cycle feedback interactions between tubule pathology and interstitial pathology that potentiate tubule atrophy. Modified from reference 4, with permission. Blood flow is persistently decreased after IRI in deep cortex and outer medulla—the regions most injured by ischemia. The decrease is brought about by vasoconstriction, tissue edema, endothelial swelling, and capillary disintegration, leading to microvascular rarefaction.31,36,82–95 Reduced blood flow during the extension phase of IRI could cause hypoxia in microenvironments of injured tubules and promote tubulointerstitial fibrosis.31,34,36,82–86,95,96 Microvascular defects and tubulointerstitial fibrosis after AKI occur in close conjunction with tubule hypoxia shown by pimonidazole adduct formation.34,40,96 VEGF-A expression in proximal tubules is lost early after AKI followed by decreased peritubular capillary density, perfusion defects, and tubule hypoxia,30,31,33,34,36,96,97 consistent with a role for tubule VEGF-A for peritubular capillary development50 and proliferation.98 Failure of endothelial cells to regenerate after kidney injury may explain capillary rarefaction.35 Interventions that avert tissue hypoxia by increasing blood flow or maintaining endothelial integrity mitigate tubulointerstitial fibrosis after kidney injury.34,37,99 These findings dovetail findings that tubule VEGF-A in tubules decreases after injury, and VEGF-A expression in pericytes/fibroblasts and macrophages shifts from predominantly VEGF164 isoform to dysangiogenic isoforms (VEGF120 and -188).37 Concurrently with these alterations, PDGF-B increases in tubules, endothelium, and macrophages. Crucially, blockade of PDGFRβ or VEGFR2 signaling by soluble ectodomains of their receptors prevents myofibroblast transformation and capillary damage and rarefaction, maintains normal capillary–pericyte/fibroblast interactions, and ameliorates fibrosis.37 These studies emphasize that physiologic signaling between endothelial cells and FoxD1+ pericytes/fibroblasts maintains their quiescent and differentiated states and keeps in abeyance disruptive VEGF and PDGF-B signaling that causes capillary rarefaction and myofibroblast transformation. As outlined above, falling oxygen tensions in the renal medulla could injure tubules after AKI; however, transition from acute injury to chronic medullary disease is only partially understood. Being most prone to injury after AKI, S3 proximal tubule segments in medullary rays of the inner cortex and the outer stripe of outer medulla (OSOM) have received most attention. In part, S3 segments are most injured because of cell-specific susceptibility of S3 cells.113 However, complexity of outer medullary microcirculation, disproportionately poor blood reflow to medulla after ischemia, and tubule hypoxia caused by oxygen gradients attributable to countercurrent vascular systems also contribute substantially.86,87,114–116 Most of our understanding of the AKI-CKD transition is, in fact, derived from research on the progression of tubulointerstitial fibrosis in the OSOM. We note, however, that such medullary pathology in the OSOM and conceivably, the inner stripe of outer medulla (see below), if extensive, could give rise to secondary damage in the cortex as a consequence of hemodynamic injury mechanisms triggered by significantly reduced renal mass (discussed below). However, we have little knowledge regarding the development of chronic pathology after AKI in the inner stripe of outer medulla—a region crucial for several critical kidney functions and the site of a dense grouping of collecting ducts in the interbundle region most distant from the vascular bundles and thus, most vulnerable to hypoxia.117 This microanatomic feature suggests that pathology of the inner stripe will affect the integrity of large areas of the cortical hinterland in proportion to the number of collecting ducts that are involved. Cortical damage caused by medullary pathology would be particularly severe if medullary tubules undergo atresia as the result of tubulointerstitial fibrosis and therefore, become obstructed. It is surprising that this aspect of post-AKI pathophysiology receives little attention. The cortical consequences of tubule obstruction in the medulla are exemplified by clinical experience; human papillary necrosis, such as that caused by acetaminophen toxicity, causes damage to the papilla, but this is followed by cortical atrophy. Studies have emphasized acute damage in ascending thick limbs of Henle caused by reduced blood flow and hypoxia attributable to adverse oxygen gradients,40,86,114,115,117 but there has been little focus on chronic pathology. In this connection, we have consistently noticed significant fibrosis with reduced tubule numbers in the inner stripe chronically after IRI (unpublished observations), but we, also, have not studied this pathology in detail. In-depth investigation of this aspect of medullary pathology after AKI is clearly in order. 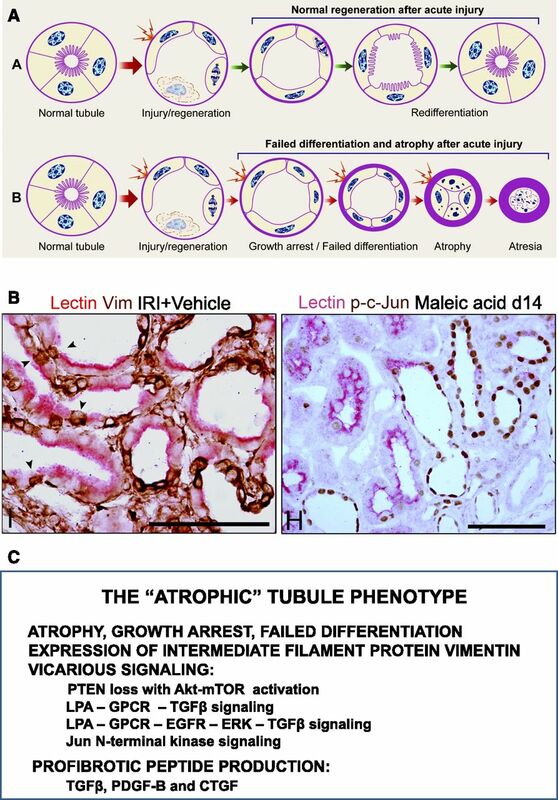 Failed differentiation of proximal tubules regenerating after AKI leads to development of the atrophic abnormally signaling profibrotic tubule phenotype. (A) Schematic diagram illustrating (upper panel) the normal pathway of proximal tubule cell dedifferentiation and proliferation followed by redifferentiation and recovery of normal structure after AKI and (lower panel) the abnormal pathway of failure to redifferentiate after early dedifferentiation that leads to tubule atrophy after AKI. (B, left panel) Immunohistochemistry and PHA lectin affinity cytochemistry of atrophic and normal proximal tubule cells 14 days after IRI in rats. Mosaic tubules showing well differentiated proximal tubule cells with brush border–bound PHA (lectin) staining pink in close juxtaposition with atrophic epithelium without brush border that stains brown for the expression of vimentin, an intermediate filament protein that is not present in differentiated proximal tubule cells but is rapidly expressed after dedifferentiation during regeneration and retained after atrophy occurs. (B, right panel) Immunohistochemistry and lectin cytochemistry of proximal tubules 14 days after AKI induced by proximal tubule selective toxin maleic acid. Well differentiated proximal tubule profiles and well differentiated proximal tubule cells in a mosaic tubule (center) exhibit pink staining for brush border–bound PHA lectin but no nuclear staining for phospho-c-Jun, whereas atrophic tubule profiles and atrophic cells in mosaic tubule (center) show nuclear staining for phospho-c-Jun, indicating the activation of the JNK-MAPK signaling pathway. (C) The diverse abnormalities exhibited by atrophic tubules are listed. These several alterations take place in vimentin–expressing atrophic tubules illustrated in B, left panel. Scale bars, 100 µm. A is modified from reference 4, with permission. B is modified from reference 39, with permission. GPCR, G-protein coupled receptor; JNK-MAPK, Jun N-terminal kinase-mitogen activated protein kinase; LPA, lysophosphatidic acid; PHA, phytohemagglutinin; PTEN, phosphatase and tensin homolog. Experiments performed in tissue culture and in vivo showed that increased profibrotic TGF-β signaling in tubules recovering from AKI is, in part, attributable to autocrine signaling by lysophosphatidic acid. Lysophosphatidic acid signaling through separate G protein–coupled receptors triggers αvβ6 integrin–dependent activation of latent TGF-β as well as transactivation of EGFR and ERK-MAPK. Although divergent when initiated, the two pathways cooperatively converge to increase TGF-β signaling and thereby, increase the production and secretion of PDGF-B and CTGF.110,118,123 Furthermore, signaling intensities as well as signaling protein and growth factor expression in these abnormal tubules increased progressively with time to strikingly high levels—far higher than during the earlier stages of physiologic regeneration.39,110,118,123 Interestingly, after microembolic kidney ischemia,119 fibrosis developed within interstitial spaces abutting PDGF-B–expressing undifferentiated atrophic tubule epithelial cells but not differentiated cells without PDGF-B. In such fibrotic microenvironments, myofibroblasts expressed PDGFRβ, the cognate receptor for PDGF-B, suggesting that PDGF-B from atrophic epithelium had given rise to fibrosis through paracrine effects. We have reported that atrophic tubules also exhibit near-total depletion of phosphatase and tensin homolog (PTEN), the lipid phosphatase that inhibits PI3K signaling.39 PTEN is normally low in proliferating proximal tubule cells but highly expressed in quiescent differentiated epithelium, and PTEN decreases were shown to be driven, at least in part, by upstream TGF-β signaling.39 However, the most proximal causes of unregulated signaling in the growth–arrested atrophic proximal tubules that develop after IRI are unknown, including those for TGF-β and the related PTEN abnormality. Recent studies have emphasized the role of premature growth arrest in giving rise to the profibrotic tubule phenotype.41 We also have observed that pathologically dedifferentiated profibrotic atrophic tubules with signaling disorders are growth arrested, which was inferred by lack of expression of Ki67, a marker for cycling cells.39 Whether tubule growth arrest during regeneration after AKI is a uniquely controlled pathologic event that causes profibrotic signaling or part of a spectrum of pathology controlled by a common upstream abnormality that also disrupts differentiation programs, causes ongoing cell injury, and instigates profibrotic signaling remains to be determined. Paracrine triggers that compromise capillary integrity and activate myofibroblast precursors during AKI may derive from inflammatory/immune cells and stressed tubule epithelium. Because tubules and capillaries can be simultaneously injured during AKI produced by ischemia, it is difficult in these contexts to distinguish the most proximal activating factors that drive endothelial–pericyte/fibroblast dissociation, capillary rarefaction, and myofibroblast proliferation. Interventions, such as TGF-β antagonism, that protect against fibrosis development after IRI110,111 cannot distinguish between benefits conferred by restored microvascular integrity and those that promote tubule recovery. Nevertheless, tubule damage, by itself, can be sufficient to produce the full spectrum of interstitial pathology. Infiltrates of myofibroblasts and monocytes/macrophages developed exclusively around proximal tubules selectively damaged by uranyl ions, and images of 3H-thymidine autoradiography in sections stained for α-SMA showed clear relationships of regenerating epithelium to myofibroblasts in surrounding interstitium.124 Fibrosis developed around tubules selectively injured by folic acid, and affected tubules in hypoxic environments (indicated by pimonidazole adducts) showed loss of VEGF-A corresponding to fibrosis and capillary loss in adjoining interstitium.96 We investigated tubulointerstitial fibrosis in rats after injections of maleic acid,39 a proximal tubule–selective poison.125 Two weeks after maleic acid, patchy fibrosis with mononuclear cell infiltrates developed around atrophic tubules39 together with capillary rarefaction and myofibroblast increase in the interstitium (unpublished observations). Furthermore, selective proximal tubule injury produced by diphtheria toxin treatment and Kidney Injury Molecule-1 or Notch1 overexpression leads to interstitial inflammation, fibrosis, and CKD126–128; recent studies suggest that tubule–derived wnt and sonic hedgehog ligands, tubule-specific activity of ADAM17 protease, and other pathologies strictly localized to tubules are sufficient to drive interstitial fibrosis 41,58,62,129–133 We note here that such cross-talk between injured tubules, peritubular capillaries, and interstitial cells through locally activated mechanisms has the advantage of circumscribing the fibrotic response and minimizing dissociation of nephron function and vascular perfusion. Failed tubule differentiation and RMR after AKI lead to hemodynamic abnormalities that cause progression. Schematic diagram illustrating the effects of AKI that lead to tubulointerstitial fibrosis, the RMR that retards recovery of tubules regenerating after AKI, and the resulting disproportionate further reduction of renal mass that triggers hemodynamic mechanisms of renal disease progression. Failed tubule recovery after AKI in rats with severe RMR was attended by hypertension.29 Severe RMR impairs renal blood flow autoregulation.134,135 Severe RMR, impaired blood flow autoregulation, hypertension, and glomerulosclerosis are closely related.134,136 Therefore, we surmised that high systemic arterial pressures in RMR rats recovering poorly from AKI would be transmitted through less responsive arterioles and damage glomeruli. Rats with IRI after severe RMR not only became hypertensive but also proteinuric; in the most hypertensive animals, proteinuria was severe, and glomeruli showed focal/segmental hyalinosis, necrosis, and sclerosis.29 These findings showed that, in a normotensive setting with impaired blood flow autoregulation (caused by RMR), poor recovery from superimposed AKI was sufficient in itself to cause hypertension.29 Rats with severe RMR were not hypertensive before IRI. Without IRI, control rats with severe RMR remained normotensive for 6 weeks.29 Furthermore, the majority of such rats with 75% RMR produced by surgical excision without IRI are known to remain normotensive up to 6 months,137,138 unlike rats with 75% RMR produced by unilateral nephrectomy and partial renal infarction that develop hypertension, vascular damage, and progressively increasing glomerulosclerosis, tubule atrophy, and fibrosis by 16 weeks.135 Even lesser degrees of RMR may predispose for such pathologies in the aftermath of AKI. Uninephrectomized rats (50% RMR) but not rats with intact kidneys (0% RMR) developed hypertension, proteinuria, and glomerulosclerosis over several months after IRI.34,139–141 It is unclear how incomplete tubule healing and fibrosis after AKI in rats with RMR give rise to hypertension. Prior observations suggest that hypertension after AKI may be volume dependent. Kidneys develop microvascular defects after AKI,30,31,33–36,96 a pathology that is particularly severe in kidneys with RMR and superimposed IRI.29 Microvascular injury with reduction of peritubular capillary capacitance after AKI or other tubulointerstitial disease may predispose to impaired pressure natriuresis, reduced capacity of tubules to excrete salt, and volume-dependent hypertension.30,34,36,99,142–146 Notably, even without RMR, rats remain normotensive after IRI, but they become hypertensive after salt loading—unlike normal rats, which remain normotensive despite high salt loads.144 Although additional work is necessary to delineate the pathophysiology of hypertension development after AKI in rats with RMR, there can be no doubt that increased BP bodes poorly for kidneys in such contexts. Patients with CKD with compromised kidney reserve who also undergo AKI are likely to be at risk for long-term deterioration of kidney structure and function through hemodynamic mechanisms if they are also hypertensive. Indeed, it is the most plausible mechanism for progression to ESRD in patients with CKD who experience superimposed AKI. The relationships of preexisting hypertension in cohorts of patients with CKD with additional AKI as well as hypertension development after AKI in such cohorts need investigation. In summary, recent studies have provided crucial connections between AKI and CKD in terms of understanding how AKI contributes to the progression of renal disease. AKI by itself is a self-healing process, but if severe, it leaves behind tubule atrophy, interstitial fibrosis, and long-term dysfunction. However, these pathologies cannot and do not progress without additional AKI episodes. However, if AKI is massive or superimposed on CKD with compromised renal reserve, injured tubules heal poorly and cause disproportionately severe scarring with loss of peritubular capillaries, setting in motion a pathophysiology that produces volume–dependent salt–sensitive hypertension. Because hypertension occurs in the setting of impaired renal blood flow autoregulation, increased transmission of arterial pressure damages glomeruli. Serial glomerular damage and consequent tubule atrophy cause progression. On the basis of these considerations, rigorous control of BP and calorie restriction—an approach that also decreases BP—still remain staple strategies to delay CKD progression. However, it is unclear why tubules regenerating after AKI sometimes fail to differentiate, a pathology that instigates fibrosis. Therefore, investigation of the conundrum of failed tubule differentiation after acute injury has the potential to uncover strategies that prevent AKI-CKD transitions, preserve renal mass, and thereby, delay hemodynamically mediated progression.